wow!!!! so glad to finally have the full reveal on this one - it's spectacular! Absolutely stunning Cindy! 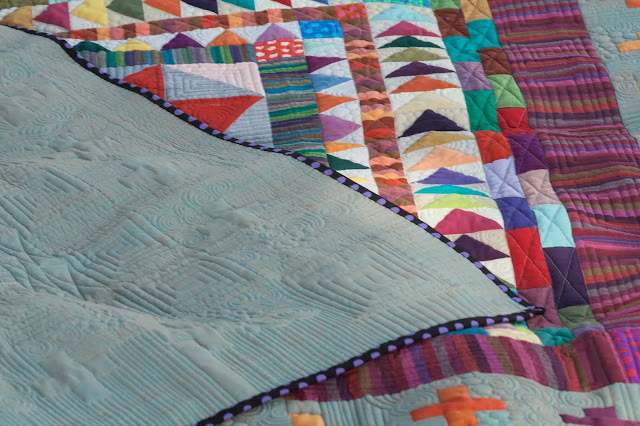 Your fabric choices are just perfect, and Krista's amazing quilting is the icing on the cake. This is an absolute stunner Cindy! Congratulations on a real 'show stopper'!!! It is beautiful. Love how the Oakshotts colours just shine in the flooded on the grass photo. The best I've seen...just beautiful! Absolutely stunning! I saw this as it was getting quilted on instagram and was drooling over every photo! I would love to make something like this one day, you have really inspired me. Stunning in all ways! Christa is a fabulous photographer. May I borrow her sometime? Hee hee! it's a beauty! 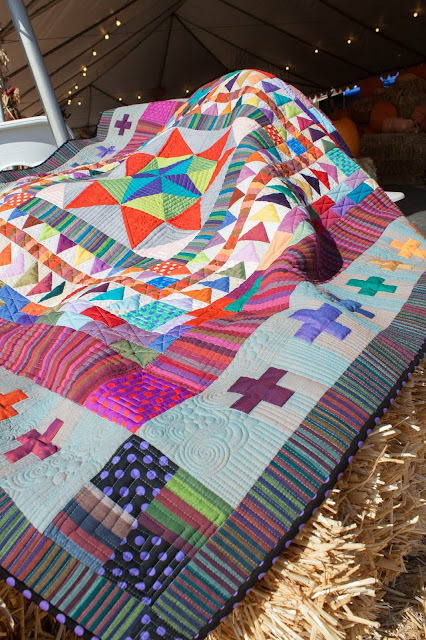 I love the fabric combinations, and the quilting looks spectacular. This may bee my favorite Marcella quilt that I have seen! Great job! It's just so fantastic...I will say it again! Great pics too! It looks just stunning! Great job on it and the quilting is beautiful. wow, this is one absolutely positively stunning quilt!!! Everything about it is perfect. This quilt is one of my all-time favorites Cindy! Love it, love it, love it. I finally bought that book - this quilt is on my bucket-list. Very Very pretty! Great job! This is gorgeous! I am IN LOVE! What a winner! It's definitely a work of art. This turned out so beautifully!!! OH MY - the shot cottons - and using the stripey ones as borders... WOOO Nellie! 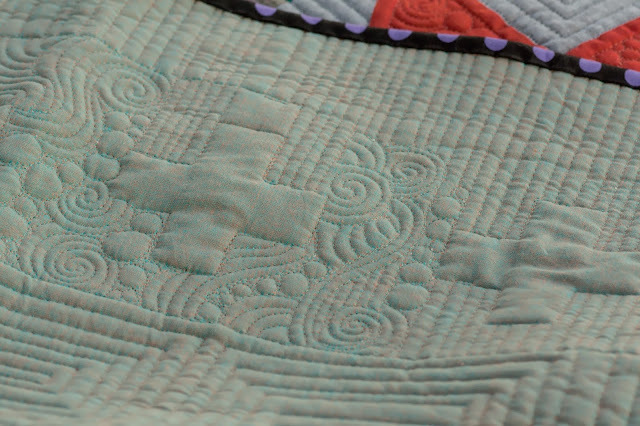 She did a beautiful job on the quilting, too. Love it! Congratulations on this wonderful finish! Lovely quilt! Looks like a lot of work. Love the circus rides as the background. I love your version of the Marcelle Medallion. I love your use of Kaffe fasset fabrics, all those yummy shot cottons and fun stripes. 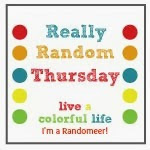 the colors are so warm and vibrant, you did a lovely job with this, Cindy! I love this quilt, and you inspired me to do THE Marcelle myself! t is gorgeous, and you are right. It really does glow. I love your color choices. I agree with your impression. I made a quilt with dots and stripes, and I thought it looked circus like also. Gorgeous use of those Oakshotts! Gorgeous quilt! And fun too, love the name. This is really one awesome quilt!! So glad you shared it for the festival! I am completely impressed! This is such a wonderful example of what can be done with solids. Fantastic!!! WOW!! I think this is my favorite Marcelle medallion yet!! I love the shot cottons and yes, the quilting does make it a work of art! Truly stunning!! Wow Cindy just WOW!!!! Your rendition of the Marcelle Medallion is stunning. 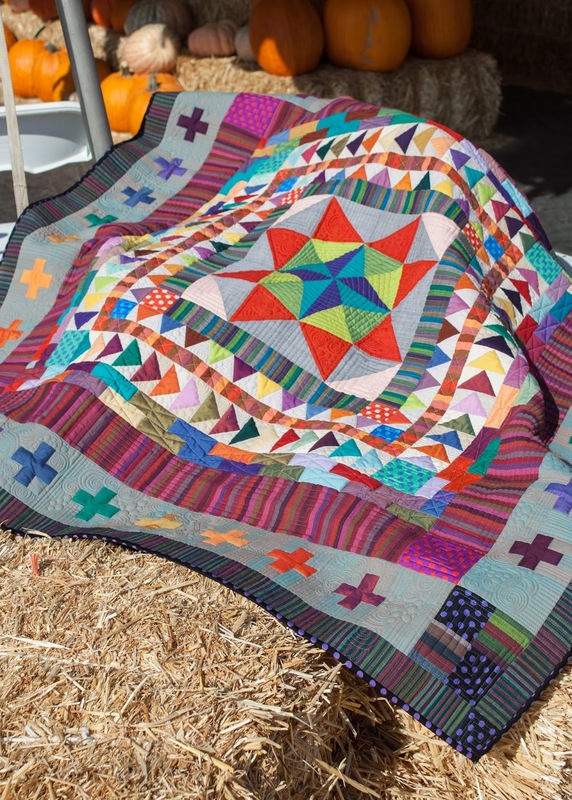 I love all the colorful Oakshott fabrics and Krista and Christa did a wonderful job with the quilting and photography. So happy to see the full reveal of this one. Wow! this is just stunning! I love it! You are so right the Oakshots and Kaffe just make it glow - what great fabric and color choices. And the quilting is amazing - congrats on a wonderful finish! Beautiful! It's a real stunner and the carnival is a most excellent background! Gorgeous quilt, I was so tempted to join that quilt along, but I resisted. I'm starting to regret it now, if you know what I mean, LOL! Wonderful modern take on the medallion quilt! I especially love your colors. Your Marcelle quilt is wonderful, Cindy! I'm very impressed that you have this finish for inclusion in the Bloggers' Quilt Festival. All the best for a big win! What a beautiful quilt! 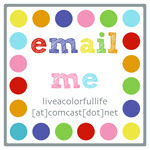 I love the name of your blog, too! Wow. Very nice. I love oakshott cotton and Kaffe. Everything about this quilt is marvelous!! Yay, for a great finish, Cindy! Oh Cindy it's completely spectacular. I adore it! 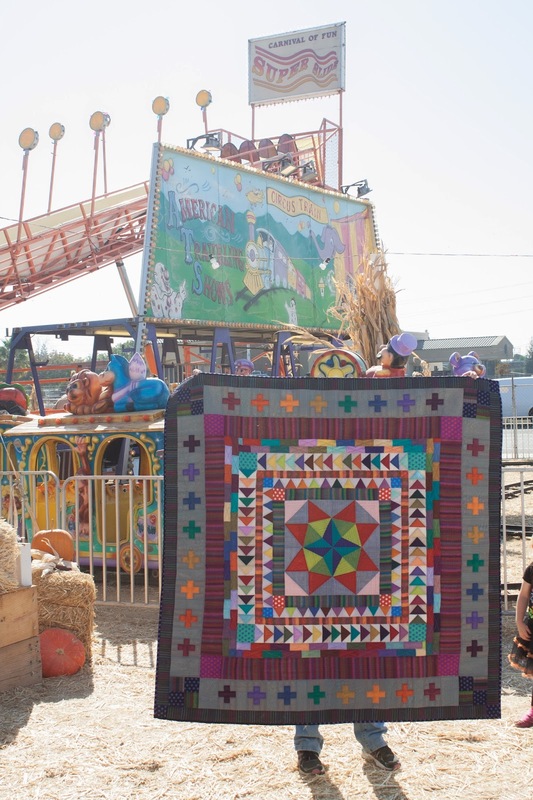 Love your Medallion Quilt and that photo at the circus is genius! What a completely fun quilt! Nice way to use Oakshott! Kaffe Fassett plus Oakshott? Genius!